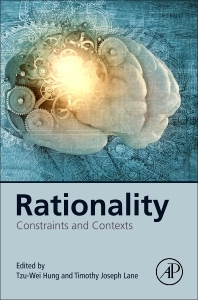 Rationality: Contexts and Constraints is an interdisciplinary reappraisal of the nature of rationality. In method, it is pluralistic, drawing upon the analytic approaches of philosophy, linguistics, neuroscience, and more. These methods guide exploration of the intersection between traditional scholarship and cutting-edge philosophical or scientific research. In this way, the book contributes to development of a suitably revised, comprehensive understanding of rationality, one that befits the 21st century, one that is adequately informed by recent investigations of science, pathology, non-human thought, emotion, and even enigmatic Chinese texts that might previously have seemed to be expressions of irrationalism. Timothy Joseph Lane holds the Philosophy of Mind Chair at Taipei Medical University (TMU). He is also Dean of TMU’s College of Humanities and Social Sciences, and Director of TMU-Shuang Ho Hospital’s Brain and Consciousness Research Center. In addition, he is a joint-appointed Research Fellow with Academia Sinica's Institute of European and American Studies, as well as an adjunct research fellow with National Chengchi University's Research Center for Mind, Brain, and Learning. His articles have appeared in numerous journals, including: Trends in Cognitive Sciences, The Journal of Philosophy, Analysis, Phenomenology and the Cognitive Sciences, and Social Neuroscience. He has been the recipient of awards from many agencies and foundations, including the Andrew W. Mellon Foundation, the National Institute of Mental Health and the Joseph and Frances Morgan-Swain Foundation. He was also awarded the Taiwan Ministry of Science and Technology’s highest award for research excellence. Tzu-Wei Hung is an assistant research fellow and a project coordinator at the Institute of European and American Studies at the Academia Sincia. His research and teaching interests include philosophy of psychology, philosophy of language, and early Formosan Philosophy. He is also the editor of Communicative Action (Springer) and Existential Engagement (Academia Sinica). His honors include the Taiwan Merit Scholarship, National Science Council and the Academia Sinica Fellowships for Doctoral Candidates in the Humanities and Social Sciences.